Film festivals are a mixed bag when it comes the effectiveness of exposure for a film. On one hand, getting your film shown at a film festival instantly gains you a laurel, you know, one of those leafy little graphics wrapped around the film festival name. You’re proud to show it off on any postcard, movie poster and disc jacket you have done up for your film. Having more than one laurel (in other words, getting into more than one film festival) is like winning more than one gold medal, you just wear them all! However, on the other hand, depending on the size of the festival, you’re a small fish in a huge ocean when it comes to having a decent size audience actually see your film. I personally have been at film festivals where the audience was packed, slam full. But on the other hand I’ve been in theaters where there was myself and about five others. And I can pretty much assume at least one of the five was the director and the rest was the director’s family. Large or small, the best thing that can happen for you having your film at a film festival is to maximize the opportunities to learn, observe and network. Learn from other filmmakers and other professionals in the industry from their experience. Observe other films and talk to the filmmakers. Get an insight as to how they made their film and what their experience was like. And network with others, you never know who you will meet and how they may have an impact on your current and/or future projects. I had the pleasure of accompanying Scott to see ‘Becoming Fools’ at the Omaha Film Festival. We made the 12 hour trek to the great city of Omaha just recently. The film was to show on the last day of the festival so we had three days prior to see what other films were showing and get a gauge of what other selections were made. We saw both narrative and documentary films. I will have to say I was pleased to see that not only films are still being made with little to no budgets but that the quality of the films are getting better, even on such tight financial constraints. Some narrative films hosted talent by working actors, some even in popular tv shows and other films you may have seen. I think it’s safe to assume that many actors and actresses are doing these independent films for the love of what they do and their love for the story. I’m encouraged by this as we look forward to future productions. Omaha Film Festival is only in it’s either year so it’s not as large as others but having been there two years prior for the showing of ‘Reparando’ I will say it has grown. That said, the film we saw seem to have an average audience size of 50-75 people. Some of the documentaries we saw had less. But even the short films group seem to draw the most, I would guess to maybe 100-150. 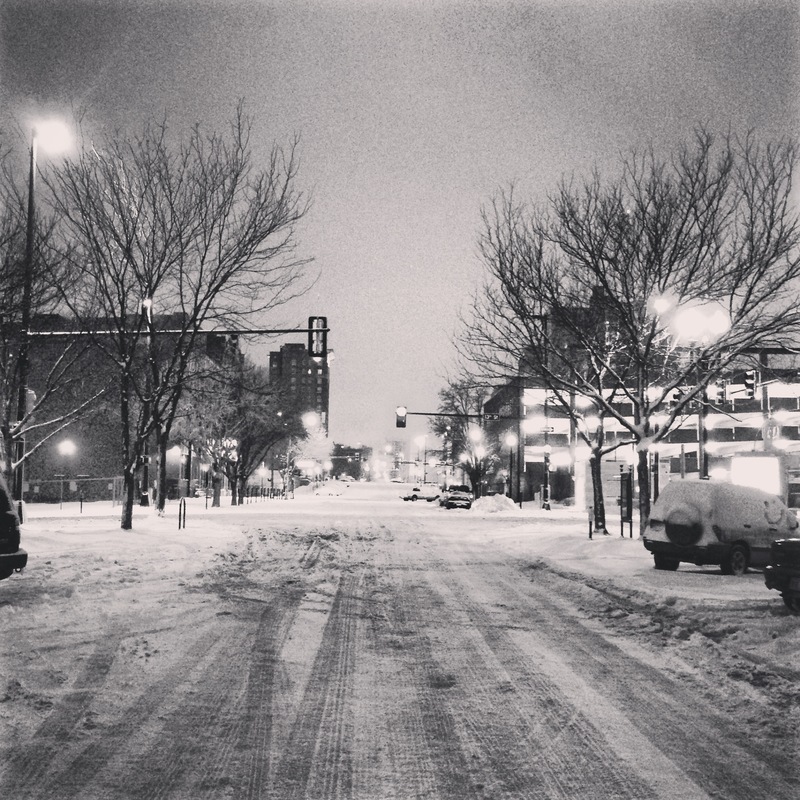 We woke up on the day of the showing for ‘Becoming Fools’ to about 6 inches of snow and more was coming! The film was showing at noon and by the time we arrived at the theater a few more inches had fell and the wind was kicking up gail force winds. Needless to say we were told some groups of people we were expecting were not going to be able to make it. I for sure thought that it would only be Scott and I, Amelia and their boys, Darlene and our friend Major in the theater. However, we were pleasantly surprised to find out that not only our local friends and family showed up in support but people as far away as Minneapolis drove through the crazy snow storm just to see the film! All total we had 50 people, not bad! I won’t say it was a total waste of time and effort. In fact, probably the opposite. We made a few more friends, got great feedback about the film and even planted a seed about where we are going from here to the festival producers. As I stated earlier, the best thing to do as a filmmaker at film festivals is to maximize your opportunities to learn, observe and network. I think we did just that! Athentikos heads to the Omaha Film Festival this week to premiere “Becoming Fools.” For those of you in the area (or know someone in Omaha), please join us in celebrating this story. Here is the press release for the film. Non-profit organization, Athentikos, premieres feature-length documentary Becoming Fools at Omaha Film Festival on March 10, 2013 at 12pm. Spring Hill, TN (WEB) February 26, 2013 — Athentikos, a non-profit film production organization that exposes need and inspires hope through the art of story, is premiering their second documentary, Becoming Fools at the Omaha Film Festival on March 10, 2013 at 12pm. This will be the first among many film festival premieres throughout the spring and summer. Becoming Fools is the ultimate underdog story of comedy healing tragedy. Becoming Fools documents the lives of Guatemalan street youth who are joined by professional entertainers in preparing for a theatrical event to honor their fallen hero, Italo, whose passion for these children started a movement teaching the art of clowning as a way to rehabilitate lives and to show these children a father’s love. The filming of Becoming Fools further ignited a movement in Guatemala set to empower youth living in the streets to rise above their situation. Over 20 diverse organizations now meet monthly to discuss ways they can work together in serving street youth. Athentikos hopes to premiere Becoming Fools throughout the US during a fall & winter screening tour. 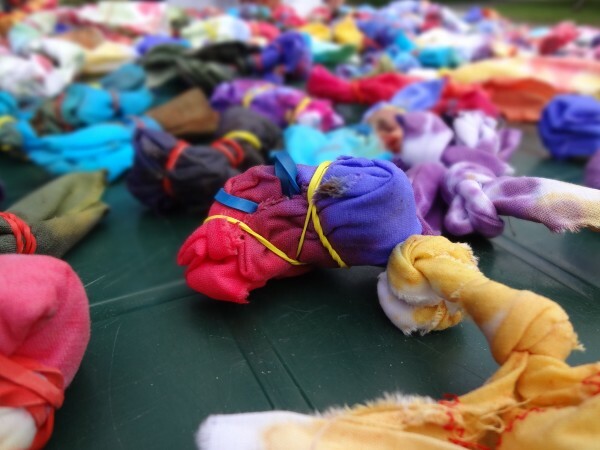 This year I wanted at Art Camp to create a memorable art masterpiece as a group that would be a reminder throughout the year of the fun we had, the friends we made and the lessons we learned. 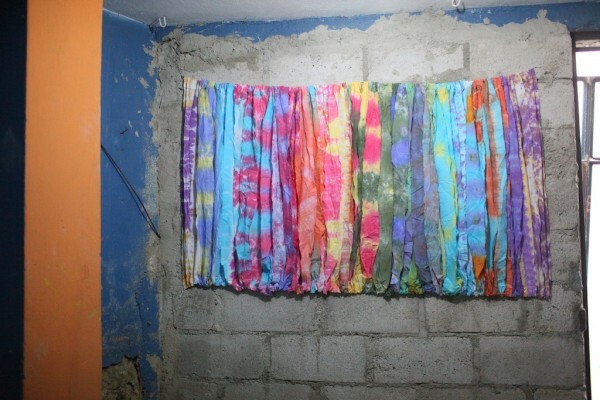 Through much planning and experimenting, I came up with the idea to create a tie-dye banner to hang in the schools in La Limonada in Guatemala City. Throughout the process, I knew what I wanted the finished product to look like, but having never done anything like this, I was unsure of exactly how it would turn out. The final result was more than I could have EVER imagined and I am so happy the kids can look at their beautiful group art work everyday in the schools! First step to making the banners was getting the material ready. I bought 5 yards of plain white muslin. Muslin is REALLY awesome because you can tear on the bias. Tearing the fabric makes creating 100+ strips of fabric so much easier. After I had tons of strips of muslin. I cut each strip in thirds, giving me ~135 pieces of 3 inch x 30 inch strips. I wasn’t exactly sure how we were going to mount the banner, but I knew the easiest way would be to hang the material on something. Therefore, I sewed 1 inch pockets on top and on the bottom of each strip. After several hours of sewing, I was off to JoAnn’s to buy fabric dye. I purchased several different brands to get the colors I wanted (JoAnn’s was a little low on their stock of fabric dye). And that was all the work I did before going to Guatemala. 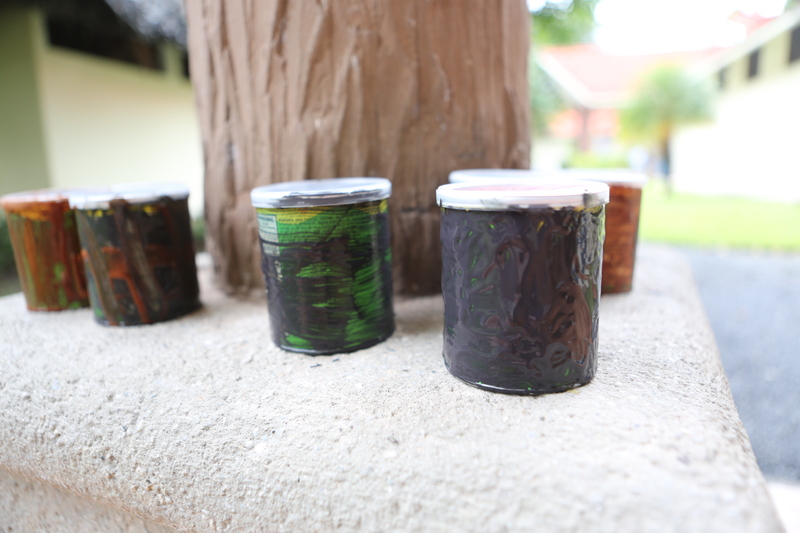 Because of limited room in my luggage and our budget, I didn’t purchase containers to mix the dye or to use to apply to dye for the fabric. I also waited until arriving in Guatemala to purchase rubber bands and salt. We waited until we were at Art Camp to start collecting plastic water bottles for the dye. A couple of hours before we were going to tie-dye, we starting mixing the dye. 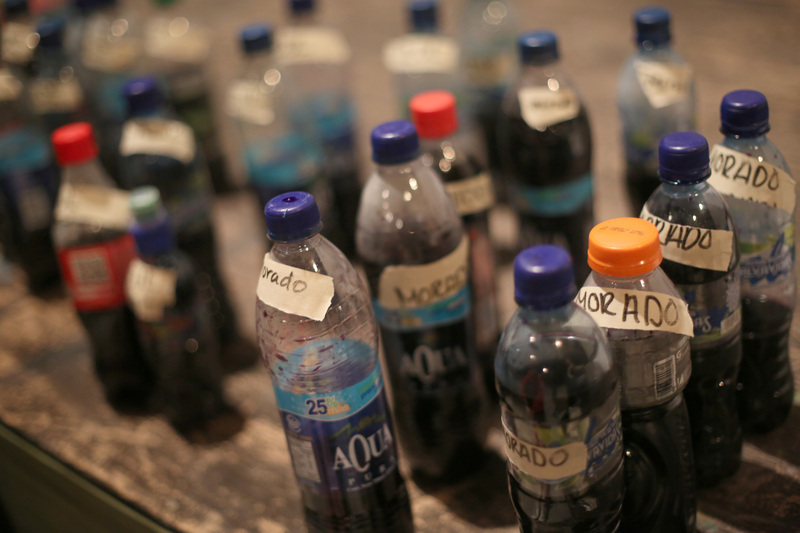 We gathered about 50 plastic bottles (some water, some Coke, some juices, etc) and started filling each bottle with hot water from the bathroom sink! We added 1/2 of the package of the dye and one bottle cap full of salt (to fix the dye to the material) to the bottle fill with water….and then shake, shake, shake and shake. The dye we used called for boiling 140° water, but we just used really hot bathroom sink water and hoped that with shaking really hard we would get the same result. After we had mixed all the dye, we separated each bottle into 2 bottles, half the mixture in one and half in the other, and then filled the bottle up again with hot water and shook some more. We repeated this separation and refill step again with some of the really dark colors or colors we wanted more of. Most of the dyes we were using say you can dilute the dye mix with 3-4 gallons of water, but we wanted really vibrant colors so we didn’t use that much water. We then poked a tiny whole in the top with a push pin. 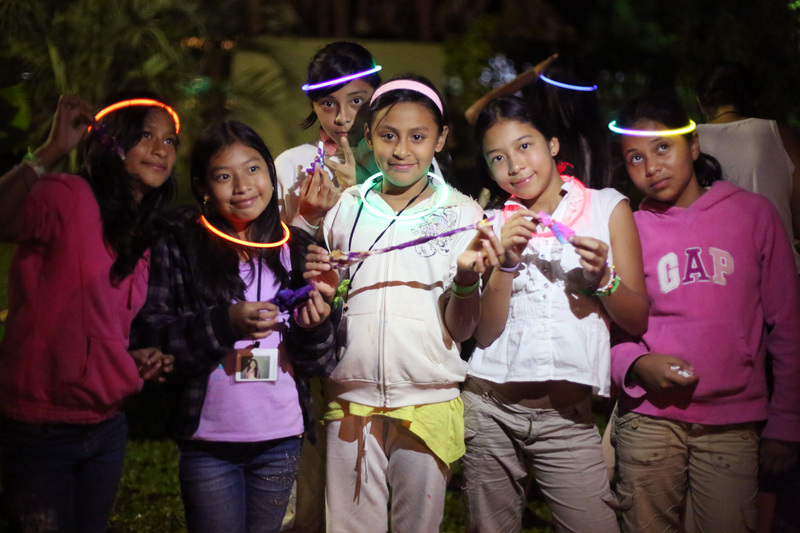 We gave each kid (and most of the adults) a white strip of materials and some rubber bands. And this is where all the fun starts. 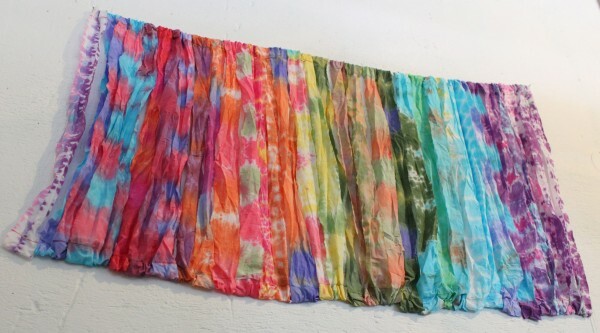 Tie-dye is created by using the material and dye to create patterns, and there are endless numbers of different ways to do it. We explained to the kids that every one could come up with their own technique for folding the material. You can roll, fold, wrinkle, twirl, swirl or squish the fabric as you wish and then bind with rubber bands to hold that pattern while you apply the dye. We then went into the grass (for easy clean-up and limited mess on the floor from the dye). Everyone chose 2 colors and sprayed their fabric as they wished. We had everyone only choose 2 colors so that we could create a “rainbow” or gradient look with the strips of fabric at the end. It is much easier to organizes strips in color order with 2 colors than with 3, 4, 5 or lots of colors. Then we waited. 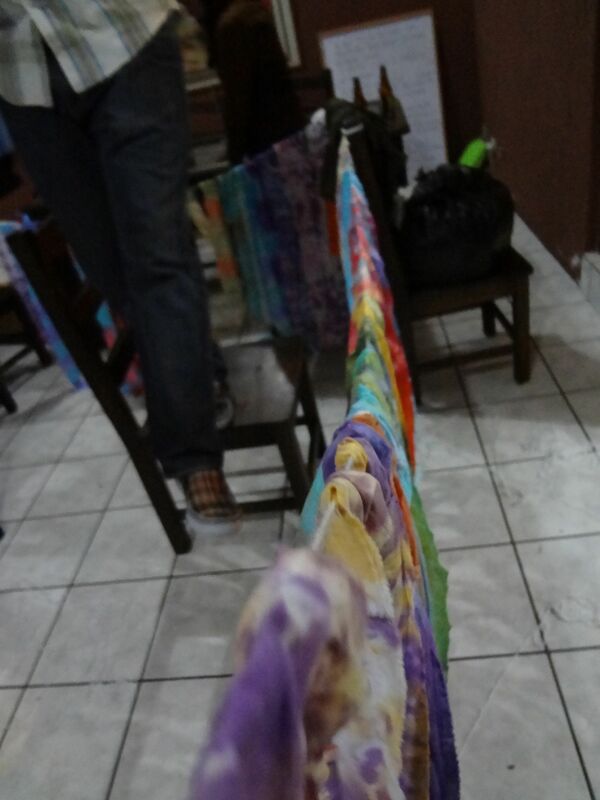 We let the fabric sit rolled, folded or swirled on a table overnight. And then let each kid open a strip the next day. We didn’t bother with names or who’s was who’s. 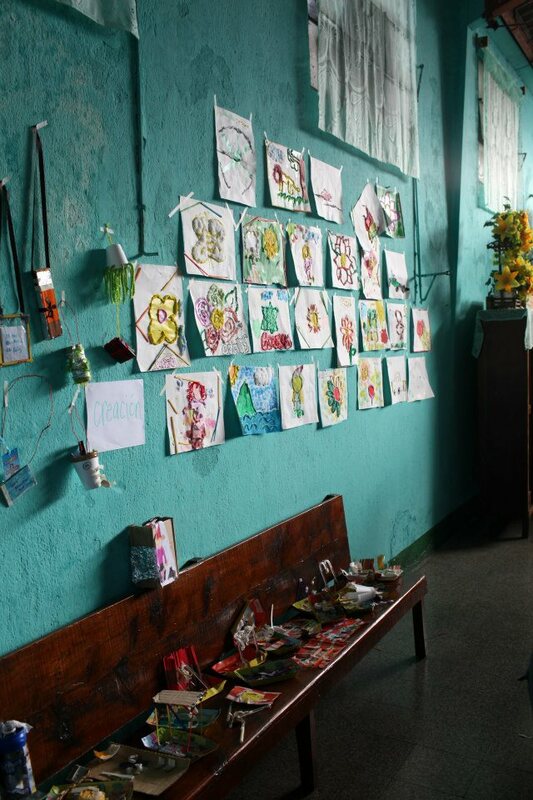 We encouraged the kids to see this project as a group project and TOGETHER we were creating something beautiful. It wasn’t important who had the most beautiful strip or who’s was the most creative because each piece was equally as important in creating the final product. I used this time to explain to the kids that the project is much like their life. They are all different but together than can be the beautiful future of their community and their country. 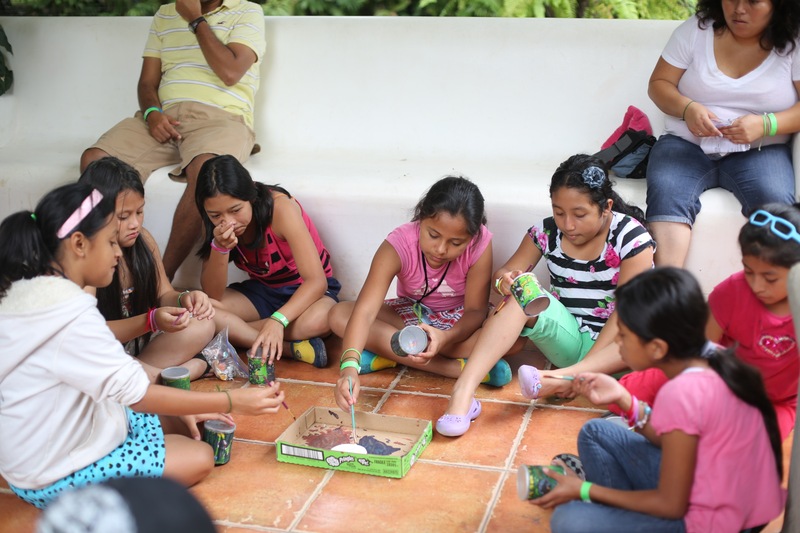 The kids at camp are from different rival areas in La Limonada, and while in La Limonada are not allowed to cross area boundaries because of gang violence. 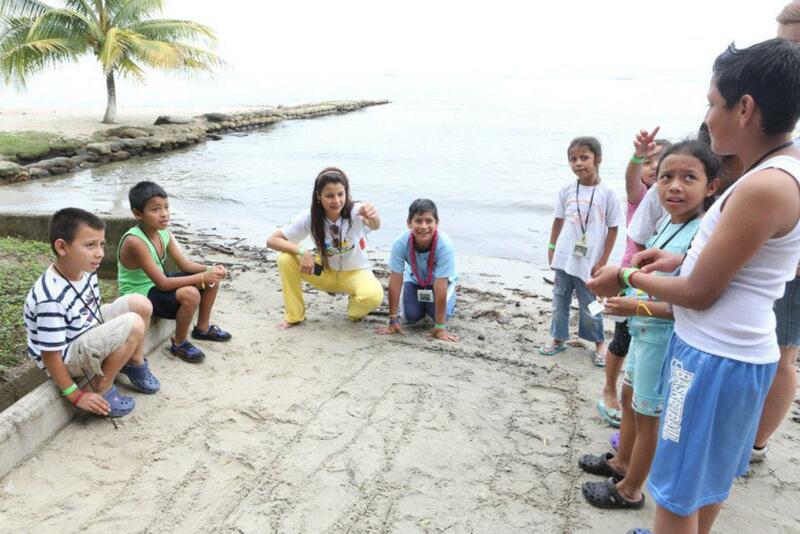 However, at camp they are free and develop close relationships with one another. It is these relationships that can change the future of their community, La Limonada. After Art Camp, we assembled all the strips into banners for the schools. We hung that at the Art Show and then hung them in the schools before we had to leave. The banners are absolutely beautiful on the walls, and I hope they do remind the kids of Art Camp whenever they look at them! ValorArte 2012 was an unforgettable experience. 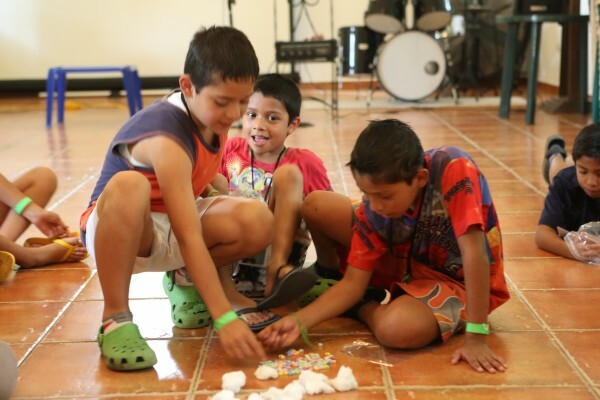 I am so happy to have been a part of it again, and I hope and pray everyday that next year we are able to give the amazing experience of Art Camp to the kids of La Limonada again. Fundraising has started, and we have a long way to go. If you are interested in sponsoring a child to go to Art Camp or would like more information, please contact me at ericha@athentikos.com. Becoming Fools is an official selection for the 2013 Omaha Film Festival! We are grateful for the opportunity to share Becoming Fools with Omaha and look forward to enjoying the festival events! We would love to pack the house. Please save the date: Becoming Fools will screen sometime during the festival between March 6-10, 2013. 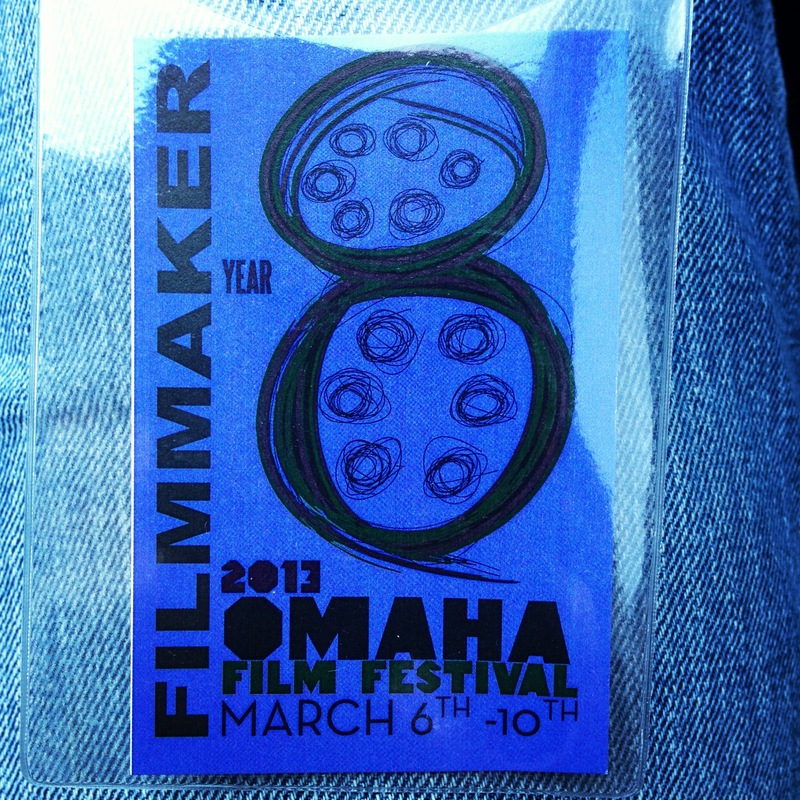 Thank you to the wonderful team at Omaha Film Festival! Hello All! My name is Tina. I had the pleasure of teaching the Music class at Art Camp this year. 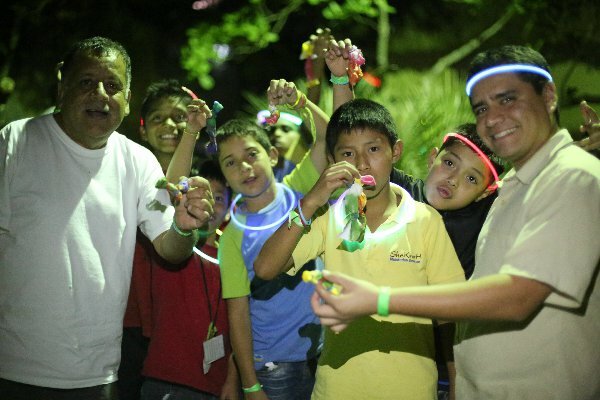 The main focus of the ValorArte 2012 was discovering how we are treasures of God. In our Music class, we created drums. The drums made beautiful rhythms, while also teaching the kids important lessons on their personal value in this world and to God. Our class was focused on rhythm. We took empty Pringles cans (ok, we ate the Pringles!) and turned them into drums to use to make music. The drums were a representation of ourself. The first day of class, we painted the drums black. This represented the darkness that surrounds us and also the darkness and sin we carry within us. The next day, we painted the drums all white. This was to represent God covering us and making us new, a blank canvas ready to be made into a masterpiece. Then the final day, we painted our drums in beautiful colors, glitter and jewels. This was to represent the unique beauty God has created in each of us. Each day, we also had a theme to the class: How our identity is shaped by everything around us. We focused on family, friends, community, environment and self. Each day in our class, I placed a pile of cotton balls and a pile of beads in the middle of our circle. The cotton represented the negative that is given to us in our lives, or “put inside our drum”. The beads represented the positive that is given to us. The beads make a good sound in the drums and the cotton blocks it. Each child chose 5 pieces every day, a combination of cotton and beads, while thinking about the subject of the day. These 5 pieces would symbolize their family, friends, community, etc. and the positive or negative that each bring to their lives. For example, when we talked about family, the children thought about their family and decided whether they got mostly positive or negative from them. They then chose cotton, beads or a combination to represent what their family “puts into their drum”. Each day we would take the cotton out of the drum together, leaving the beads. We threw the cotton out; throwing away the bad and keeping the good. This was to show the importance of keeping the good in our lives so our drums make a good sound, but throwing out the bad so the sound is not blocked. We had a wonderful week together. 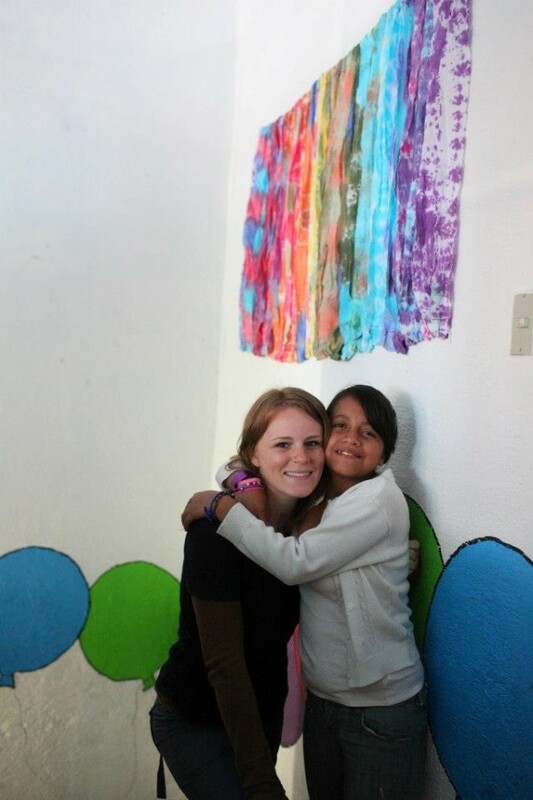 Some days were very challenging, but by the end of the week I could see a change in the kids. These are kids that I worked with for the entire year, but at Art Camp there was something softer about them. To hear the things that they had to say, to see the ease with which they expressed themselves, both verbally and musically, was something new and hope-filled. Healing took place and will hopefully continue! 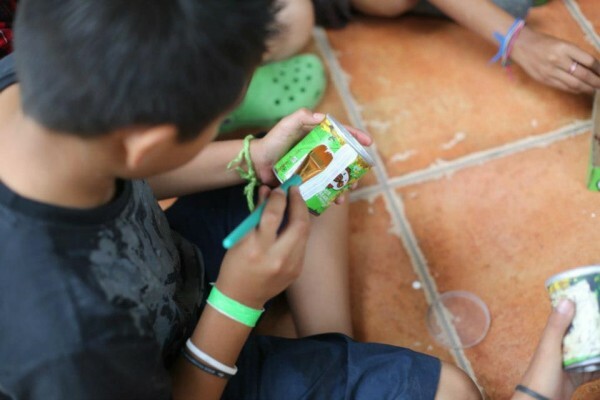 If we describe what “Creation” means, we usually would use the definition of creating something using our imagination, but if we take the definition from the Bible, like we at Art Camp ValorArte 2012, we will use the definition of “producing something from nowhere”, like God did it with us. He was so inspired and He still is, that He took a deep breath and created magnificence creatures and every single place we stand in. For us, each kid is an amazing creation, so putting them in contact with their own imaginations we saw amazing creations using…EVERYTHING. 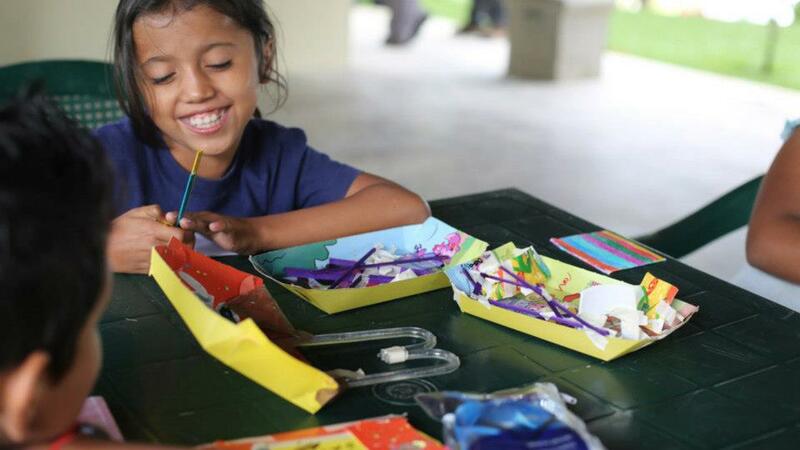 In the creation class, the kids used materials that we use every day, every moment, without realizing in how many ways with our imagination, we can use that material to create an amazing art project. We used water bottles, chip bags, used cardboard and plastic (plates, forks, etc. 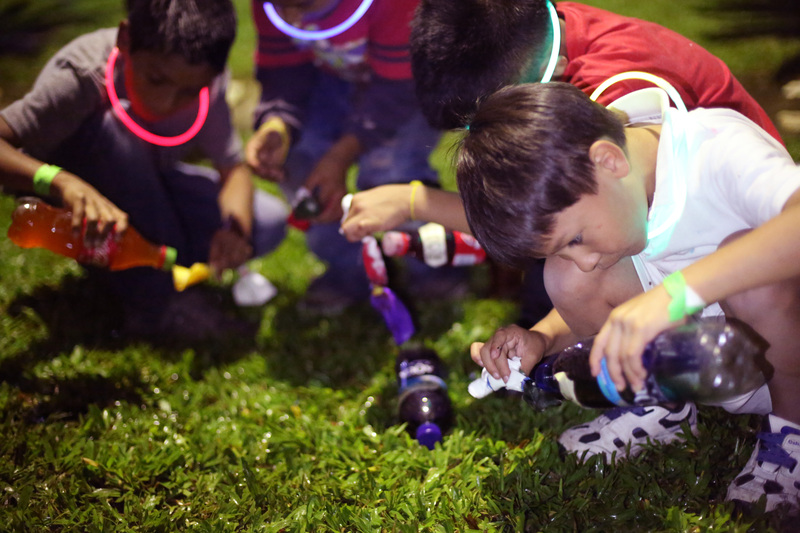 ), Styrofoam cups, aluminum foil, string, rope, toilet paper, paper towel and much more! 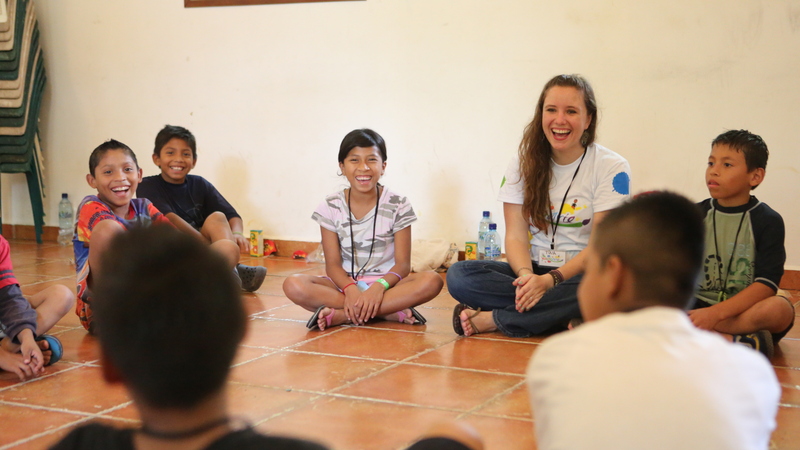 We realized the only things the kids needed was imagination and encouragement. 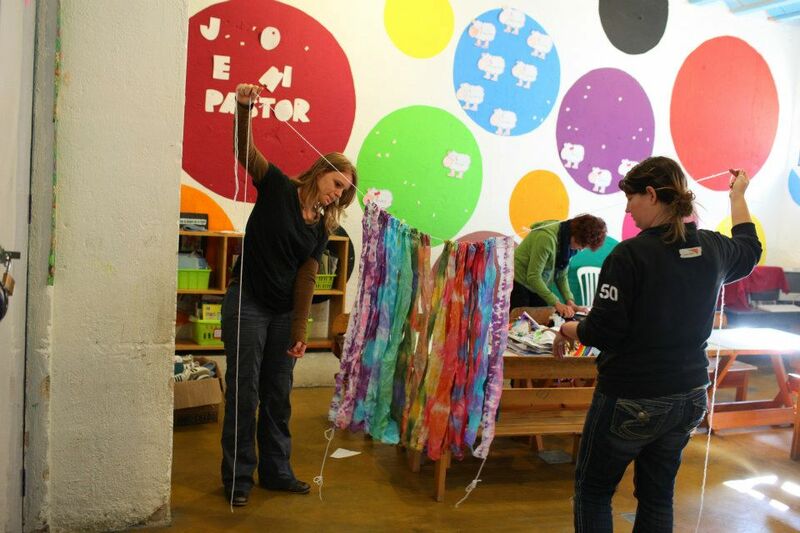 They needed people like us to believe in their abilities and with some helpful tips, we got the best-recycled materials art museum EVER. Their creations were not only works of art, but also expression of their soul because each creation is a story telling us what and how they feel. It was just fascinating!! Every day, we focused in a bible verse. We used the bible verses to connect their creativity with their spiritual and sensitive side, getting not just this amazing art works, but making them value what they did, getting them to value their selves. We talked with the kids about how their identity is shaped by my family and heritage. We made a floor plan of their houses, reflecting what they liked and didn’t like about their home. We then created their dream home out of different recycled materials. I mean, after all in our heritage we were promised the Promised Land. So if we are sons and daughters from a KING, that means we can have anything we want, it’s just a matter of believing, or better said… FAITH. Also, we talked with the kids about how their identity is shaped by their community and friends. We made a secret present for a friend. 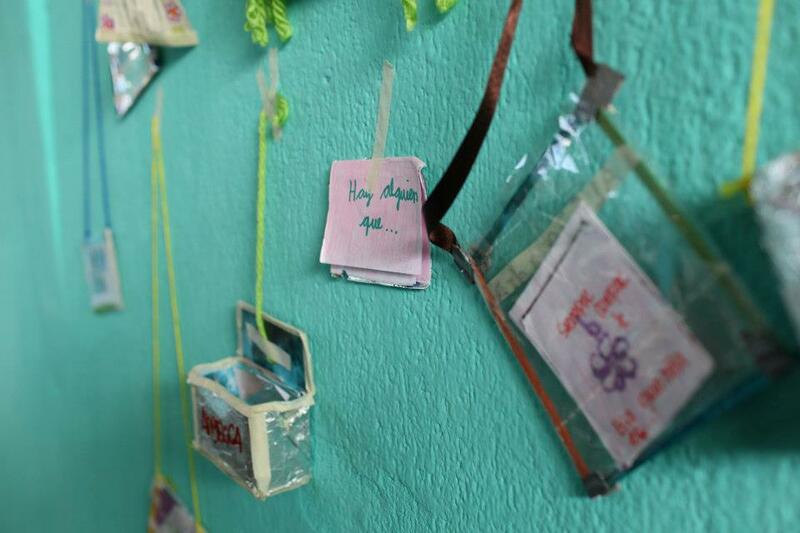 Each present had their friend’s amazing characteristics and abilities written on it. We taught the kids to remember that every characteristic we have makes us unique. Each day we had a different reflection, a different art project, a different experience and a different way of getting to know each kid. We enjoyed their laughing, their talents, their creativity and their huge smiles. Most importantly, each day, we had an opportunity to change someone’s life. 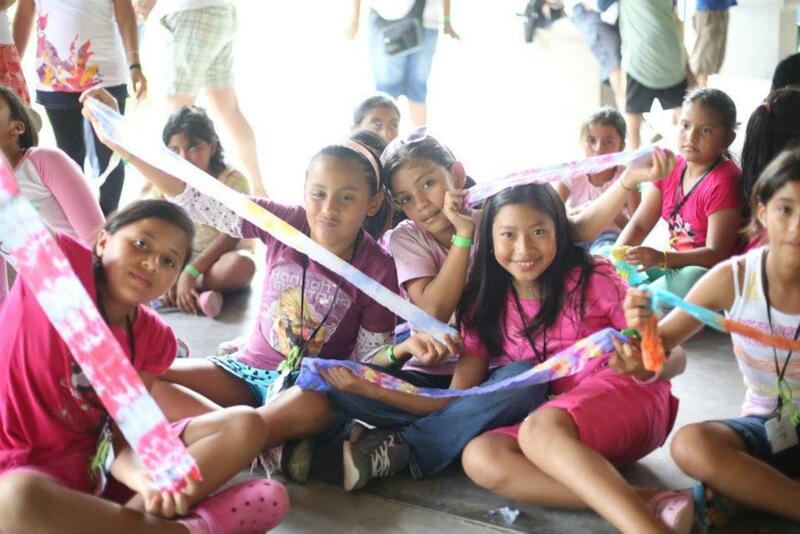 Art Camp was an opportunity to make a difference in their lives and make the kids realize how incredible they are. When the kids created their dream houses, they didn’t ask for a huge house with plasma TV’s, all they wanted was an opportunity or for someone to believe in them and show them how far they can succeed. At the end of the day if God carried a huge cross for our sins, and for us to live this amazing life, we can help someone carry their own cross; their heavy and painful cross. Together our cross will never be heavy, because we have someone helping us. We have the ability to change someone’s life, so what better way to change this world than by helping a kid with a huge cross? I guess all we need is to create, to believe and to act.